The CarveWright Wood Carving Machine (CW001), also sold as the Craftsman CompuCarve, is an innovative, compact table-top wood carving machine that is quite impressive. The CNC software is very easy to learn, and the wood carving machine creates carvings that are quite dramatic. While some hand-sanding of the final carving can be expected, the unit produces consistent, reproducible results that would impress even the most experienced woodworker. While the unit is a bit expensive (about the same as a quality cabinet table saw), it is certainly not over-priced for the value and results it produces. We liked this tool a lot. Software requires WinXP/2000 or Mac OSX 10.4, with minimum 128MB RAM, 75MB hard drive & OpenGL graphics card. Maximum workpiece size is 14-1/2" wide, 5" tall and 12' long. Minimum workpiece size is 1-1/2" wide, 1/2" tall and 7" long. Accepts 1/4" & 1/2" shank bits, but due to manufacturer tolerances, CarveWright bits are recommended for accuracy. Software accepts imports of .JPEG, .GIF, .BMP & .PNG files. Future software versions are expected to accept imports of more standardized CAD formats such as .DXF, .STL and more. 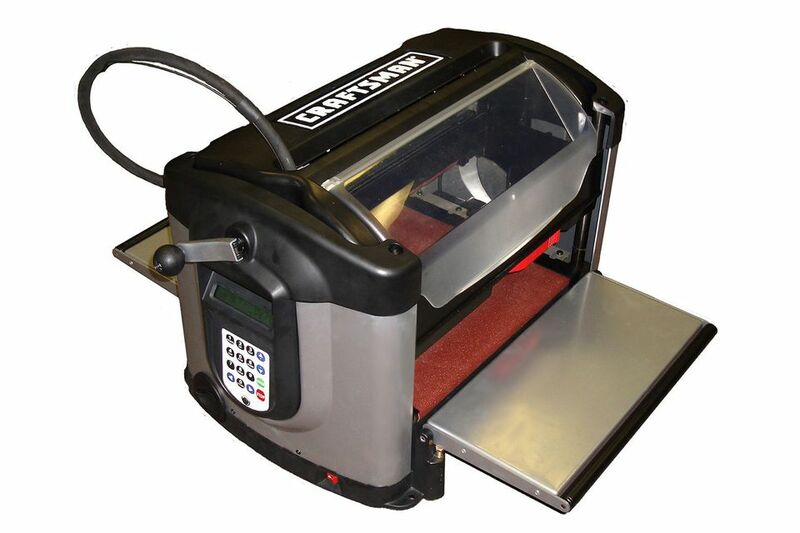 The CarveWright has the ability to cut edge profiles and can trim a board to a specific width or length. Once your design is completed, the file is downloaded onto a memory card (included). The memory card is then inserted into the CarveWright machine. After inserting the piece of stock to be carved, the operator follows the instructions on the LCD screen on the CarveWright to load the file for carving. After the file is loaded and any options chosen, the CarveWright measures the board, then asks for a specific bit to be placed into the chuck. With the proper bit installed, the unit begins to carve the design. We did encounter a few minor hiccups while working with the software. For one, we found that when using the text tool with some fonts, the last character was regularly chopped off. The simple workaround was to add a blank space after the final character. We also noticed that, during the board measuring step prior to carving, the unit seemed to stop while a soft but consistent beep tone emitted from the machine. The first time this occurred, we turned off the machine after a minute or so, assuming that a system glitch had occurred (because nothing was apparently happening). However, when the same issue occurred on the second attempt, we walked away and found that after about three minutes, the unit proceeded properly. All in all, this machine would be a terrific carving tool for small production shops. I know I could find a lot of uses for one in my shop.